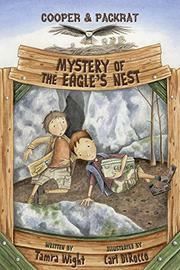 In the second eco-mystery in the Cooper and Packrat series, Cooper and his friends are on the trail of eagle poachers. Nature-lover and critter-defender Cooper Wilder works at his family’s business, the Wilder Family Campground, where he does odd jobs and, to his chagrin, cleans cabins and toilets. With the help of his best friends, Packrat and Roy, he also hides geocache boxes throughout the campground for the campers to track and uncover. On a routine check of one of the boxes, Cooper finds himself pursued by two goofy suit- and tie-clad goons bent on stealing it from him. After losing them, he and Packrat open the box—but they don’t find the usual logbook and pencil. Instead, it contains a real eagle’s head adorning a ceremonial stick along with a pair of eagle claws and a handful of feathers. Knowing that the birds are a protected species, Cooper dives into the mystery. Wight ratchets up the threat level when the two men—as well as a series of additional suspicious-looking guests—check into the campground. The well-plotted story with spot-on kid dialogue will have readers alternately laughing and puzzling out the mystery; DiRocco’s simple black-and-white illustrations neatly highlight both funny and serious moments. Alas, going without depiction is one hilarious scene in which one of Cooper’s friends attempts to distract the bad guys by burping through the alphabet.